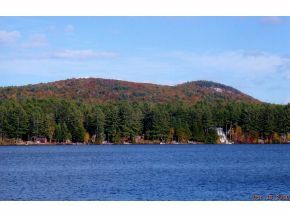 Crystal Lake in Gilmanton New Hampshire is over 440 acres and has some great trout fishing. The lake is located in Gilmanton Iron Works the location where in 1956 a novel by Grace Metalious titled Peyton Place was fictionally based. This fully landscaped, like new home sits at the edge of pristine Crystal Lake. The lake and mountain views are truly hard to beat. The home features include a den with a gas stove and a gas fireplace in the living room for those winter evenings. For the summer evening you have an enclosed sun porch, 2 decks, sandy beach, swim raft, dock for your boat and a garage across the street to store your car, snowmobile or boat. Listed by Curry Realtors. In 25 minutes you can be skiing at Gunstock or you can snowmobile from your front door to Canada. For additional information on this home call Lady of the Lake Realty at 1-888-737-5550 or e-mail at info@nhlakesrealty.com or visit our website to view similar lake homes in New Hampshire at www.nhlakesrealty.com or www.lakeorskirealestate.com Contact us today!